Smith and Nephew Opsite Flexifix Transparent Tape from HealthyKin.com is waterproof and a barrier to bacteria. Its high moisture vapor permeability allows the skin to breathe. The acrylic adhesive minimizes the risk of skin damage on removal, especially after long periods of wear. Works wonderful. I use it on my pain patch and get the three days out of one easy. Wonderful! We use it to cover the omnipod and CGMS!! Great tape for my daughter's Dexcom CGM. She's had skin problems with other products, but has had no trouble with this tape. It'll stay on for 4-5 days, unless she's sweating alot, outside in the summer months and even that, the tape will stay on for a full day. 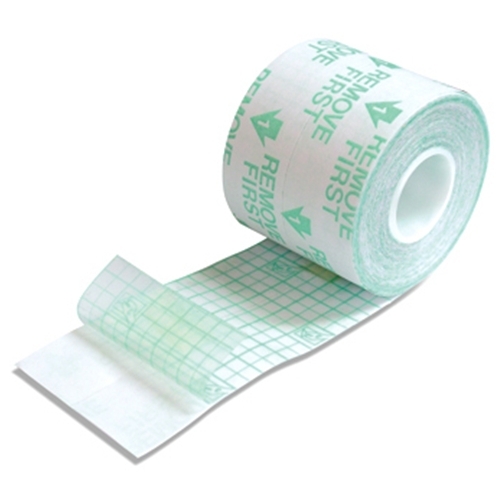 This tape is excellent and is very strong, light and flexible. . It arrived very quickly . We love it. We use it to keepbthe cgm in place. I love tis product. I use it for covering my omnipod and CGM. This deserves a 10! I use it to 'waterproof' my ostomy. Swimming and taking a shower isn't such a big deal with this tape!